With many upper cabinets going by the wayside, we're seeing a lot of statement backsplashes, which in turn, have given rise to the backsplash shelf, a single shelf lining the top of the backsplash–a twist on open shelving that we really like! Perhaps the modern equivalent of the butler's pantry, walls with floor-to-ceiling storage are a clever solution for the homeowner who loves the sleek look of little to none when it comes to traditional upper cabinetry but can't bear to lose the storage. Here's how we envision the modern kitchen of 2019: no upper cabinets above the countertops with perhaps a few simple floating shelves or a single backsplash shelf (check out our heavy duty steel shelf brackets), a large island, and floor-to-ceiling storage where possible. 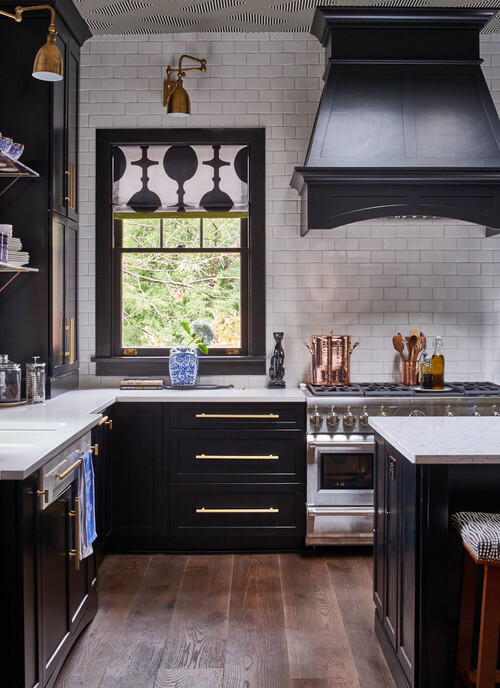 Photo by Lind Nelson Construction Inc.
Black brings sharp contrast and elegance to kitchens, especially when combined with warm woods and gold finishes. Terrazzo is making a big comeback for both floors and countertops. The material actually dates back several hundred years but was most recently very popular in the mid century throuh the 70s. 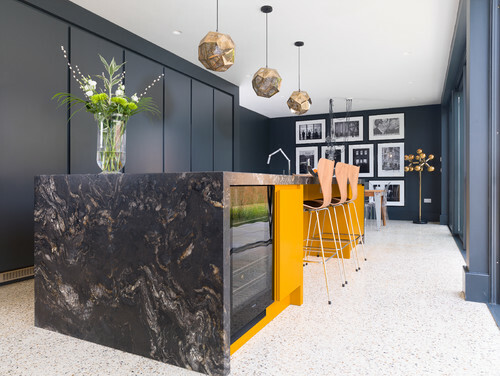 Terrazzo is usually made from small pieces of marble, quartz, glass and other materials that are set in concrete or resin and then polished to a high sheen. It's requies skilled artisans to create it, but the new porcelain terrazo looks amazing and is readily available. 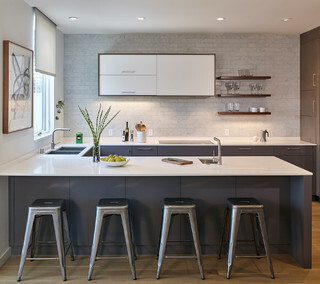 The statement range hood has been strong for several years, but 2019 is pointing to a rise in concealed kitchen ventilation. 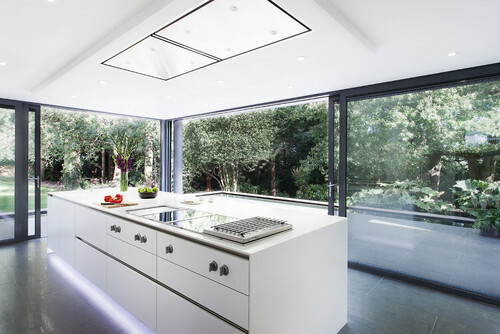 Some of these ventilation systems virtually disappear in modern kitchen design, and the look is definitely in sync with the trend towards more minimalistic design in the kitchen. A number of familiar brands have started introducing ceiling-mounted recessed vents. 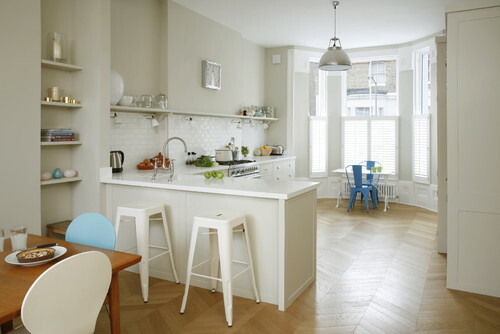 Other unobtrusive kitchen vents are under-the-cabinet, slide-out, and downdraft vents. 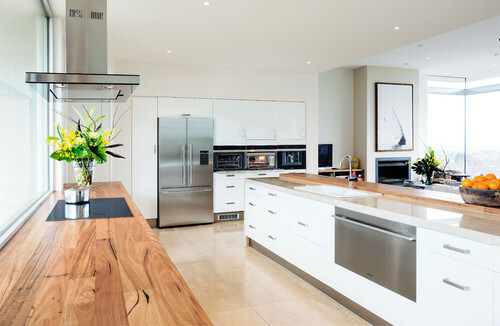 No matter what your design style, The Original Granite Bracket® has the countertop support you need to invisibly, securely, and safely support your investment. 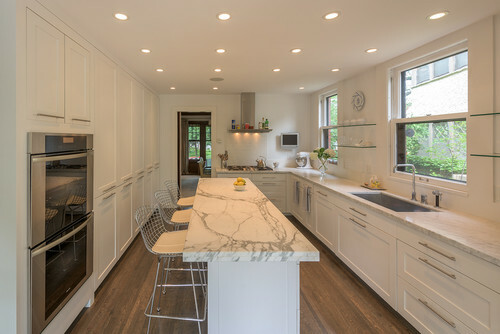 We're the only bracket manufacturer who has actually been in the stone countertop fabrication and kitchen design business – we're here to make sure you get the right brackets for your project. Connect with us today!